No one knows the real origin of the Vanilla Wafer. From what I've read it was developed in the South long before Nabisco started producing the scrumptious wafers. 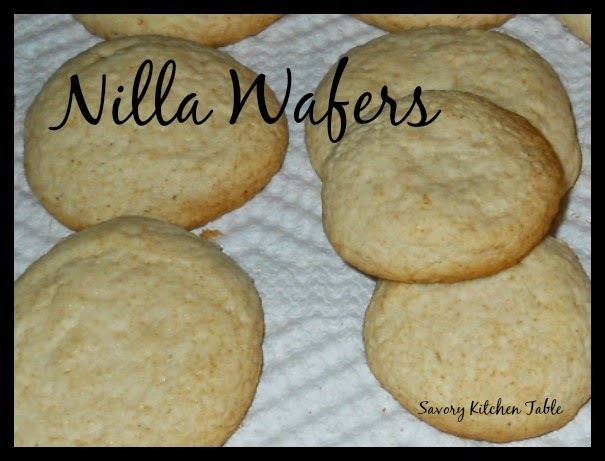 Nabisco began mass producing them in 1945 as Vanilla Wafers before they trademarked them as Nilla Wafers in the 1960's. Cream together sugars, shortening, egg, vanilla and salt in a large bowl. Add water and continue mixing until dough forms a ball. Roll dough into 3/4" balls and flatten slightly onto a lightly greased cookie sheet. Bake for 12-15 minutes or until cookies are a light brown. I bet those would be yummy homemade! !